Clean burning flame paste which burns with a bright orange flame. The flame is almost smoke free. This paste does not "go off" or dry out as easy as other brands on the market. It is black or white in colour and has the consistency of light jelly. Perfect for use in Handheld Flame Torches as its a non drip paste. MagicFX Flamaniac Flame Fluid for use in the Flamaniac. This 2.5lt of fluid will give you up to 350 shots of flame up to 6m tall. We can supply the internal canisters for MagicFX Stage Flame units. 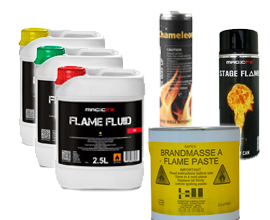 We can supply a range of natural and coloured fluids designed to fit the Le Maitre Chameleon & Salamander Flame Machines. Available in Natural, Green and Red in 500ml canisters.